"The Chenghua mark dose not have the dot under the great character making it Taisho period 1913 to 1926 or later the dot changes the great to greatest." The pictures aren't that great so sorry about that. 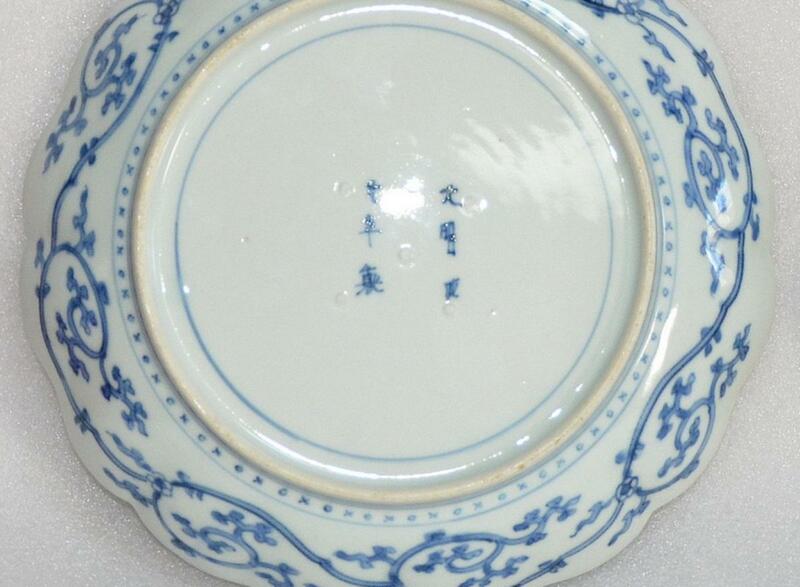 The owner insists the lack of the dot is immaterial with Japanese porcelain and they are EDO plates. The difference is huge especially financially.. Any help would be gratefully received. EDO or Taisho. It would be nice to put the loop on them and look hard. I am not convinced they are a pair either. The colour looks different although yes that could be the photo. From these pictures details of rust spots are unappraisable. Subject:Re: Edo plates or later? Normaly I ignore questions about bying or selling objects but I like to share these pictures of a dish from my own collection wich I dated as mid Edo to compare. Even with dot It probably would be of Edo period (used in 18/19th ct), without... anything from 17th to 20th century. 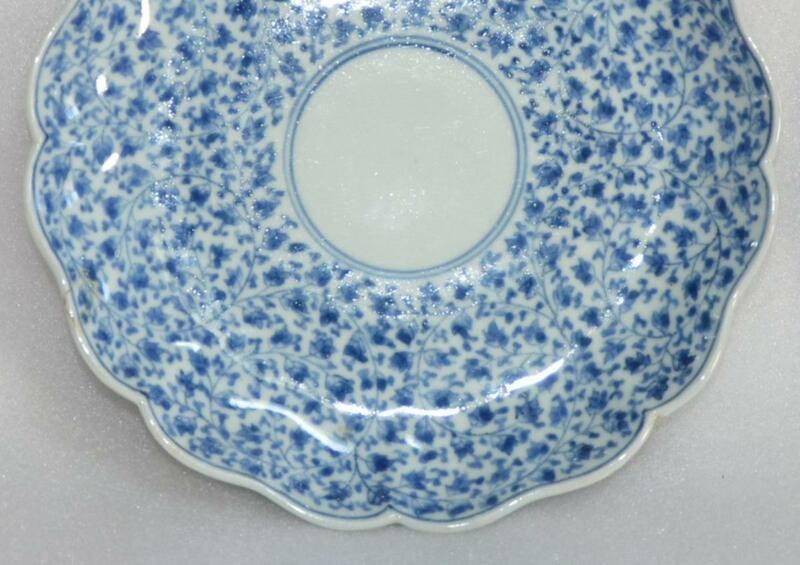 It's very unusual to find spurmarks on a dish/plate from taisho period. 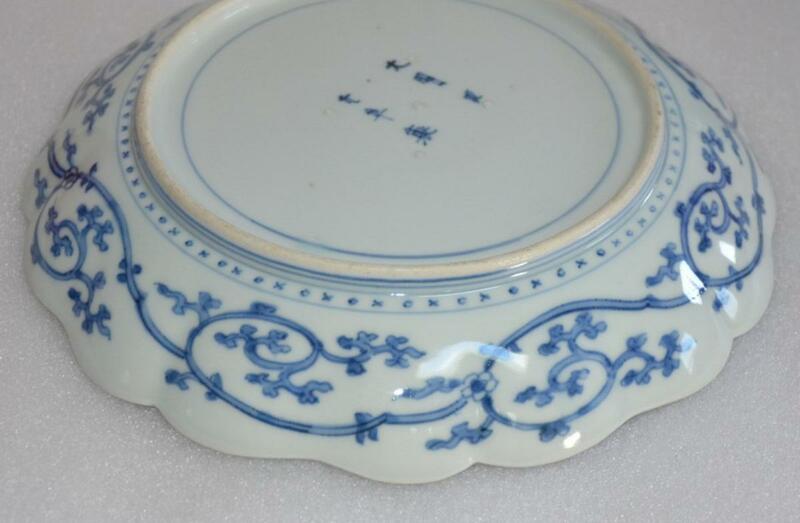 My first thought was also a mid-Edo (18th century) dating from the rather sophisticated design, the support scars, slightly rippled glaze, and the clean, white porcelain biscuit at the foot ring. 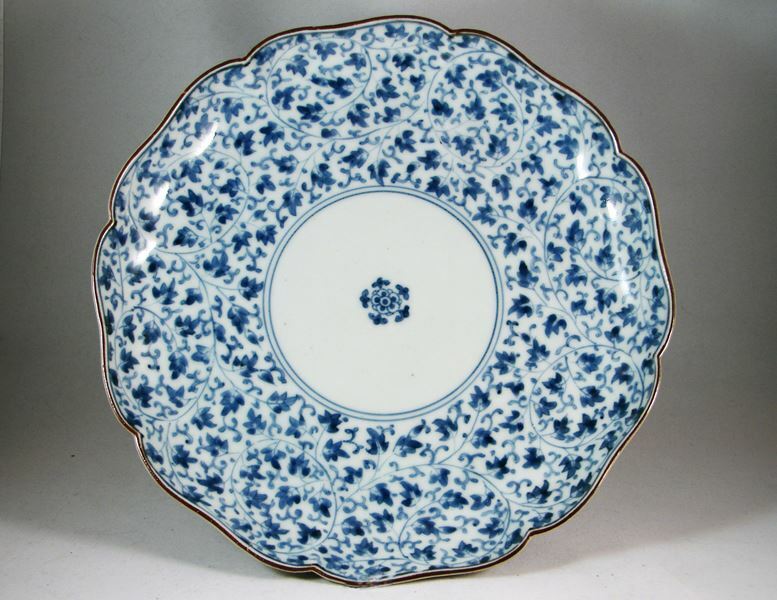 As an afterthought I wonder if the broad floral scroll border and small central reserve are modeled after an earlier blue and white Delftware dish. Arjan: Do you think that a possibility? Oh crumbs! So you think they maybe even be delftware? The Dutch do good porcelain but I would have sworn these were Japanese. I'm really taken aback at "even" the possibility. Maybe I read the sentiment of your message incorrectly Robert. My apologies for my clumsiness. 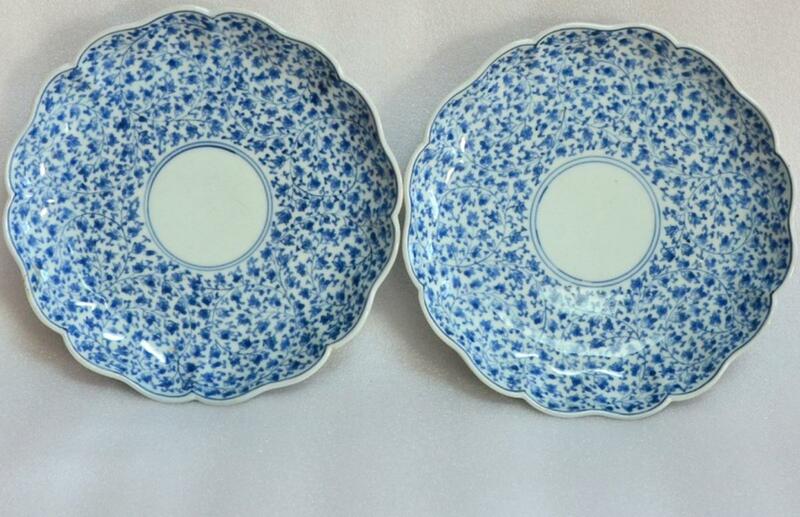 These could be a design taken from a Dutch original and made in Arita. The Dutch were certainly big players in trading with Japan so influences would naturally cross. Altough the distance between my hometown and Delft is less than an hour I don't know anything about delftware. Thanks. I just meant that floral scroll or arabesque decoration is not quintessentially Japanese. 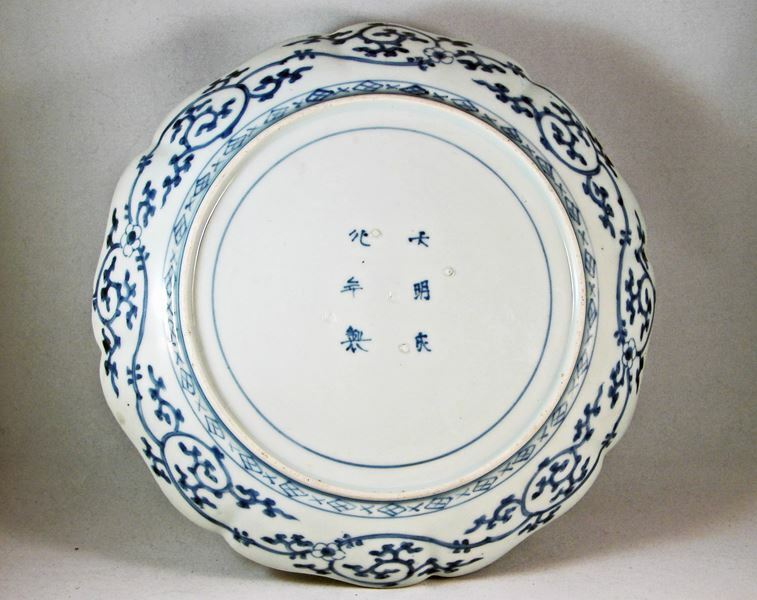 The Japanese may have seen it on Chinese porcelain or on Delftware. Very useful information and my gratitude for upping photos and explaining. I will need to think again. They are very nice plates.